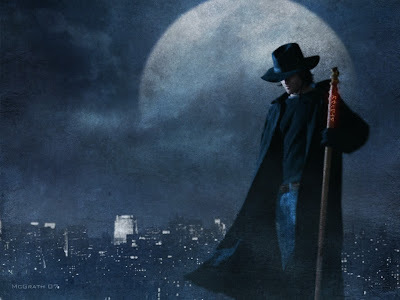 I can't be the only bookworm out there who'd like Harry Dresden to be her literary leading man. Harry is a wizard. (He's got an ad in the phone book and everything.) However, wizarding barely pays the bills, so he often consults on paranormal cases for the Chicago Police Department. And even with that supplemental income, he still scrambles to pay the bills. He's a good guy who wants justice to prevail and evil to get stomped in the neck. Often, he's the guy who gets called in to do the stomping. But the thing with Harry is that evil often stomps him back. He's a powerful wizard, and over the course of the 13-book series, you see that power change, deepen and mature. But that doesn't mean that Harry has all the answers, all the time. One of the things that makes him so endearing is that author Jim Butcher isn't afraid to show Harry's vulnerable side. Harry gets scared. He gets tired and hurt and run down. He gets angry. (My word, does he get angry!) And for great swaths of the books, Harry is lonely. He's the definition of a decent man, but he's forced into life-threatening situations on a regular basis. This danger, combined with the peculiar quirks that come with being a wizard, make it hard for him to embark on romantic relationships. Even friendships can be tough. That's not to say that there aren't important people in his life. Butcher has created some fantastic supporting characters over the years to help Harry (and rescue Harry and beguile Harry and bedevil Harry). More importantly, Butcher knows how to bring characters back in subsequent books in ways that don't feel forced. Murphy, Thomas, Butters, Molly, Billy and Georgia, Michael, Bob and his romance novels, Ebenezer. There's not a character in there who isn't a welcome addition to the storyline. Butcher doesn't pander to the fans by trotting out familiar faces. Instead, every plot twist, every story arc, is finely calibrated to tell a tight, well-constructed story. Even better, people in Harry's universe grow and change. Harry is a different person in book 10 than he was in the first novel. He's burdened with responsibilities and regrets, and it's made him a darker and more complicated protagonist. Likewise, his friends, associates and enemies also evolve. 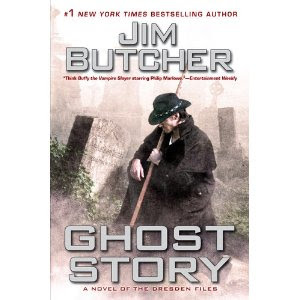 Butcher allows their experiences to shape his characters, sometimes for the better and sometimes for the worse. This has made for a book series with no clunkers and no diminishing returns. The characters don't get sillier over time, nor do they act in ways that make you shake your head sadly and say, "The Harry I know wouldn't do that." It's a true feat of plotting, characterization and writing that allows an author to produce high-quality fiction time and again, and Butcher does just that. Lucky for us, Butcher's most famous creation is someone readers enjoy spending time with. In addition to being a committed evil stomper-outer, Harry has a goofy sense of humor. He's sarcastic. He enjoys the occasional game of Dungeons and Dragons with the local werewolf pack. He's often flummoxed by women. He quotes Yoda. In short, if he didn't have his magical ability and a blasting rod to help focus it, he'd be kind of like you and me. (On the other hand, he does rock a black leather duster that's enhanced by magic. That's way cooler than anything you or I have in our closets.) There's a sweetness about Harry's desire to connect with other people, but there's also a wariness about him that comes from seeing friends endangered and lovers leave. If you'd like to see for yourself why I'm wild about Harry (come on, we both knew that joke was going to happen), start with book one in the series, Storm Front. Those of you already under his spell are no doubt waiting impatiently for the newest book's release on July 26. 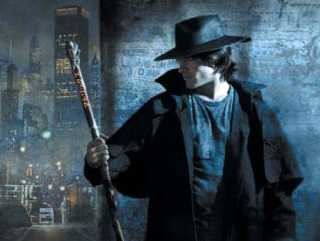 That tricksy Jim Butcher left our Harry mired in quite a cliff hanger at the end of the last book, and his fans are dying to find out how it's going to be resolved. So is Harry your ideal literary boyfriend? Great review. I LOVE the Dresden books and I think you've nailed why they are so great. Hey, my husband introduced me to the books, too! Our menfolk have good taste, no?